James Harden went from sixth man to franchise cornerstone following a trade from the Oklahoma City Thunder to the Houston Rockets. 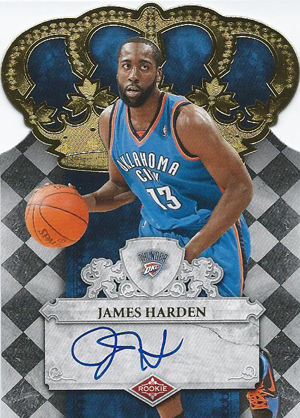 Since then, he has flourished, putting James Harden rookie cards squarely on the hobby map. In a short amount of time, the third overall pick in the 2009 draft played in the NBA Finals, won the 2012 NBA Sixth Man Award and was part of the gold medal-winning USA team at the 2012 Olympics. And while that helped garner some attention in the hobby, James Harden rookie cards still remained relatively inexpensive. 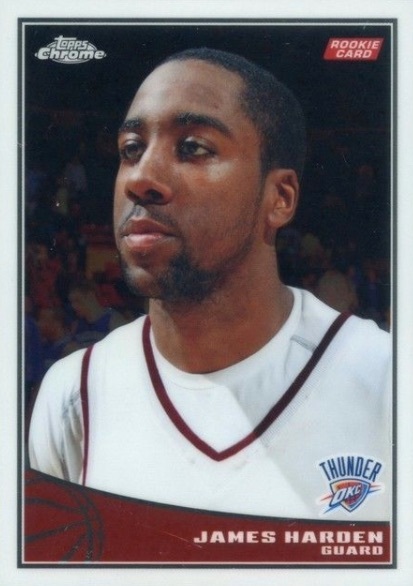 Shop for James Harden rookie cards on eBay. However, thanks to the move to Houston, things changed fairly quickly for James Harden and his earliest cards. The All-Star scoring machine has the Rockets winning. This, in turn, has regularly thrust his name into MVP consideration, which has collectors taking another look at cards for the bearded basketball star. The Rockets also added more star power to the team via Chris Paul, helping Houston in its quest for another title. 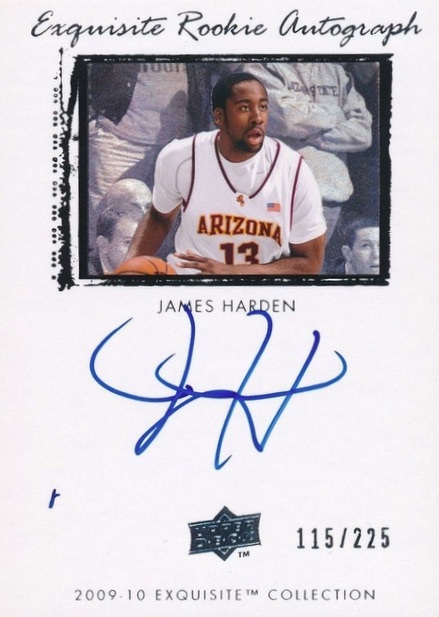 There are more than 25 James Harden rookie cards to choose from in sets issued during the 2009-10 NBA collecting season. While they're available in all price ranges, the list below focuses on some of the very best. 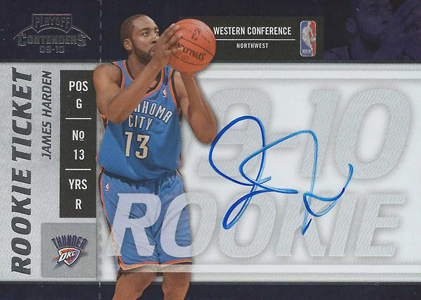 If you are curious about his other first-year cards, see our full James Harden rookie card checklist. 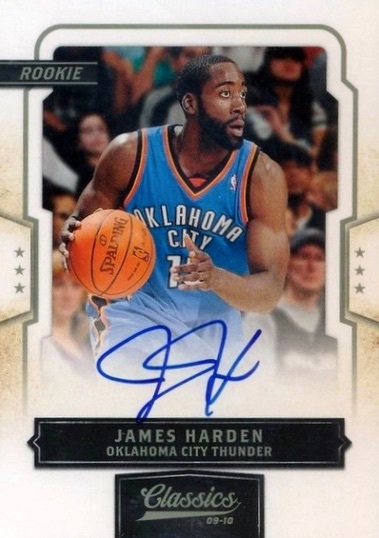 You can also see the cards getting attention online with the most popular James Harden card auctions currently on eBay. Click on the images or card listings to track prices or purchase specific cards on eBay. 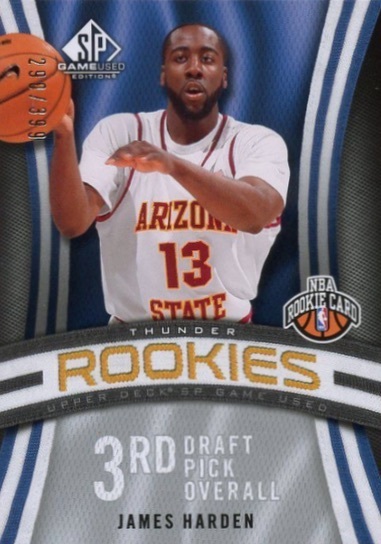 Showing Harden from his Arizona State days, the SP Game Used rookie card is from a premium product centered on hits. Due to this, the unsigned rookie can float under the radar. With a print run of just 399, the rarity helps it make the cut. There are also very rare signed versions, numbered to just five copies. 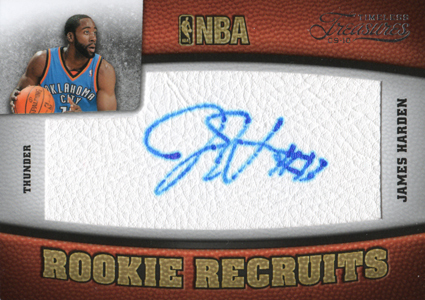 Limited to 299, the 2009-10 Panini Timeless Treasures James Harden rookie comes with an autograph on a piece of white basketball material. This gives the card a distinct look and feel. However, the uneven signing surface resulted in some autographs standing out more than others, so collectors may want to pay close attention when considering one. Also be aware of fading issues that are prevalent for the signature. While not the most visually pleasing option, the 2009-10 Panini Absolute card for Harden checks the boxes for collectors with a signature and relic. The print run is on the larger side, but there are also quite a few signed and relic-only parallels limited to 25 or less. 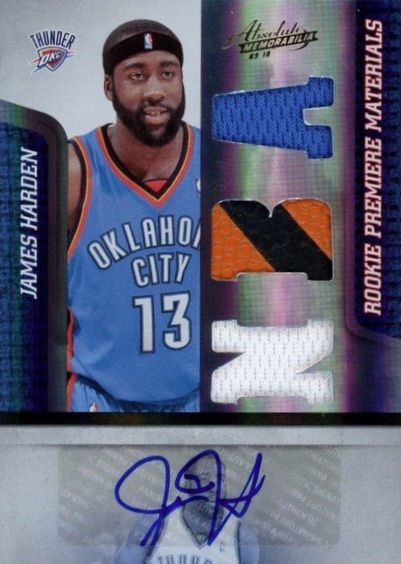 The 2009-10 Limited James Harden rookie card certainly doesn't lack any shine and the busy design includes both a jersey swatch and an autograph. A print run of 299 is another major selling point, although the sticker autograph may be a turn-off to some. Limited also adds three Spotlight parallels: Silver (#/25), Gold (#/10) and Platinum (1/1). Don't let the simple design and subdued image fool you as this James Harden rookie card from 2009-10 Topps Chrome is very popular. The base version is further helped as there was no standalone Chrome set in '09-10. Instead, these chromium cards were inserted into the main Topps Basketball product along with the parallels. Other versions include the main Refractors (#/500), Gold Refractors (#/50), and a one-of-one SuperFractor. Matching Absolute in print run, 2009-10 Classics still bests it, and half the list, thanks to the on-card signature for Harden. Several unsigned and relic-only versions are also in play. The Contenders brand has long been popular with collectors. Despite the lack of serial numbering, the 2009-10 Contenders card for Harden sells for more than most of his other rookies. Part of the Rookie Ticket subset, it offers a large canvas for an on-card autograph. Harden is found in the SSP group with a reported print run of 499 or less. For those concerned more with an autograph than a low print run, 2009-10 Panini Crown Royale is a strong choice. The print run of 599 is larger than many other cards, but it's still low enough to be a selling point. The die-cut crown design is instantly recognizable, as well. 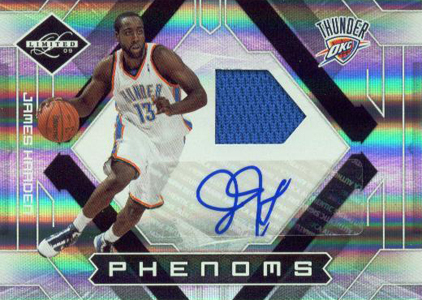 Although Panini had an exclusive deal with the NBA beginning in 2009-10, the deal didn't kick in until the season began, letting Upper Deck and Topps get in a few final sets. 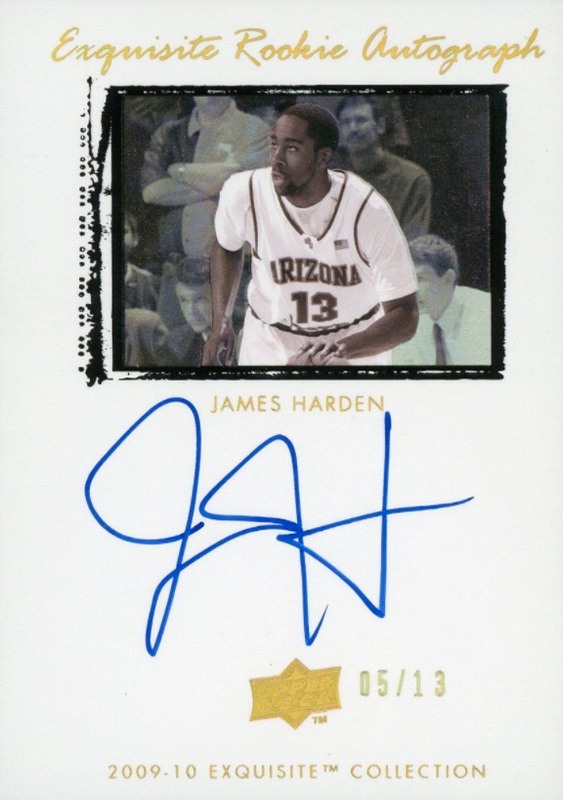 As a result, the 2009-10 Upper Deck Exquisite Collection James Harden card managed to get in under the wire. With a low print run, an on-card signature, and the pedigree of the Exquisite brand, this card is a strong second choice to National Treasures. Collectors actually have two options with different images for Harden that are each numbered to 225. The Gold jersey-number parallel (#/13) is shown for his card #74. 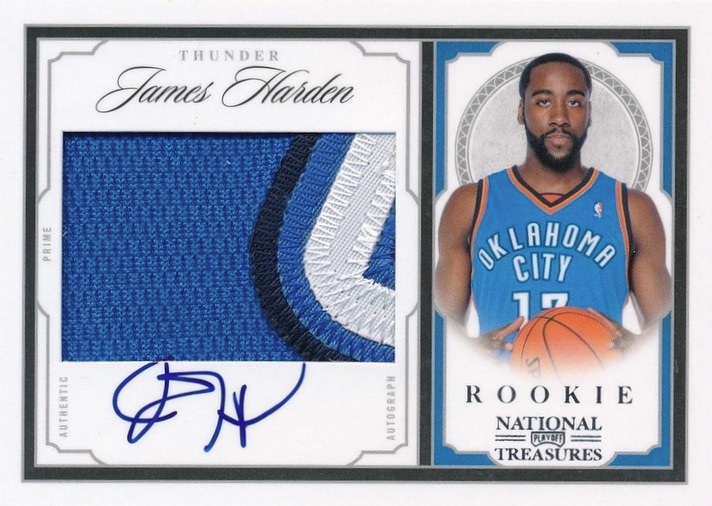 The 2009-10 Playoff National Treasures James Harden rookie card is the undisputed top choice. Limited to just 99 copies, the card also boasts an on-card autograph and a massive patch swatch. Expect to pay big if you want to add this NT rookie to your collection. JAMES HARDEN 2009 TOPPS BLUE BOWMAN ROOKIE 1948 BGS 9 MINT HOT RARE RC INVEST!